Openstore provides a rich set of business optimisation tools to support the management of cost-saving initiatives, whilst helping to drive business efficiency and the controlled management of potentially radical change. As a news production ‘bus’, Openstore enables real-time access to digital content at all stages of the news gathering and publishing process. It is built in a robust, enterprise-class, client-server environment to meet the stringent needs of the modern news publishing organisation. The production bus concept supports the best of breed application choices and working practices of newsroom and production team users whilst enabling the introduction of new applications and processes as part of a managed transition between print and online business models. Openstore handles images, articles, video and text. Any format of any media type and anything that technology might throw at us in the future. The system is channel agnostic too. Whatever direction your business takes Openstore can optimise your use and re-use of all your digital assets and their sources and streamline production workflow processes and resourcing too. Openstore is designed and architected to deliver. It has been proven in live, mission-critical press environments and the software is standards-based, high performance, scalable and secure. Openstore requires an Oracle license and is available on Solaris and Linux. The system supports browser-based thin client access as well as a Mac-based rich client. Openstore automatically routes digital media (like text, images, videos and graphics) and sorts them into business streams. It then manages the formating of thumbnails and previews and ‘openstores’ them to balance efficient use of available storage media against optimum availability. 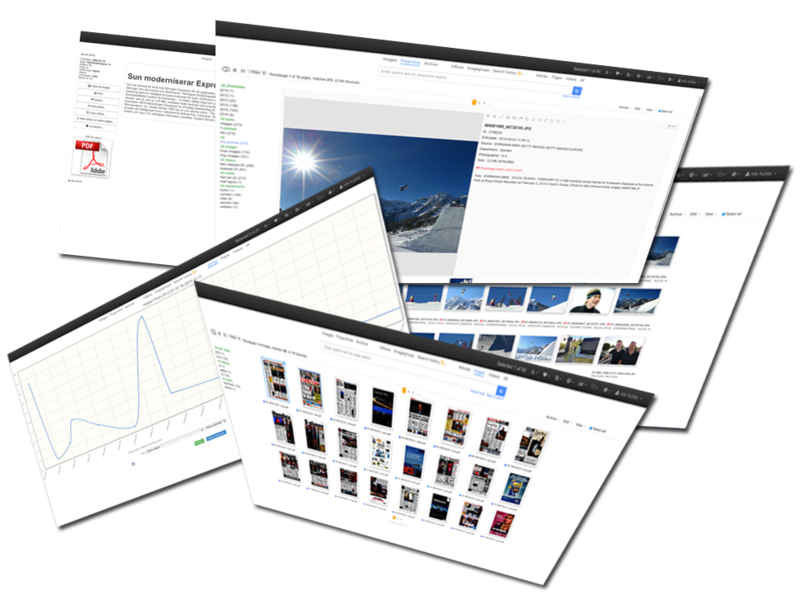 All associated metadata is extracted and stored in the database for use in image selection, page layout and other functions. With the availability of rich content governing news presentation, we know how essential high performance feeds are to the success of every edition. Openstore automates image flows processing 30,000+ images per day in a tightly monitored and stable solution. Key to building a seamless ‘production bus’ is the single point of integration that Openstore provides. Applications can communicate through simple ftp push mechanisms to more sophisticated ‘drag and drop’ and menu level integration by writing to the Openstore API. This approach creates a number of advantages when managing transition in the newsroom. Many best of breed application vendors integrate with Openstore in this way. Openstore’s Autorepro application manages simple reprographic functions defined from within editorial and page layout applications. More complex repro requirements are managed as manual tasks in a queue.